Tired of genesis taking root in your water cooling loop? Here is a perfect solution. Silver Antimicrobial tubing. Is Your Tubing Protected Against Microbes? Microorganisms are living cells so small that most can only be seen with a microscope. Microbes are a type of microorganism found everywhere, and include bacteria, fungi and algae. The majority of microbes do not interfere with human activities. However, in some situations they can cause problems. Growth of microbes on many materials can lead to foul odors, discoloration and formation of mildew and biofilm. 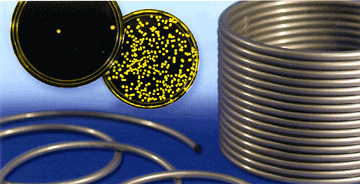 In the case of tubing, microbes can contaminate the material being transferred as well as degrade the tubing itself. Saint-Gobain Performance Plastics is the leader in antimicrobial technology. Our custom compounding capabilities allow us to produce antimicrobial versions of many of our tubing products, including Tygon. Tygon Silver Antimicrobial Tubing is formulated with a silver based compound on the inner surface at the point of fluid contact; the tubing outer surface can be treated in cases where bacteria buildup on the O.D. is a concern. Silver is known to be effective against a broad spectrum of microorganisms that cause discoloration, odor, biofouling and other aesthetic problems. Antimicrobial polymer compound can be added to approve materials at varying levels to impart fungistatic, bacteriostatic and algistatic properties to the material and the end-use product. The high temperature stability and low color formulation of antimicrobial polymer compounds translate to proven performance in a wide variety of applications.